Full name DIONER FAVIAN NAVARRO...Wife, Sherley…Three children: Gerson, Dioner and Devin … With his wife, established the Dioner Navarro Family Foundation in 2009...Did not play in 2017 in order to care for his ailing wife, who had suffered a brain hemorrhage. Did not play in 2017 and played in 20 games for the independent Long Island Ducks in August 2018...Played in 22 games in the Liga Venezuela Beisbol Profesional (LVBP) for La Guaira in the 2018 offseason, batting .284 (21-for-74) with 4 2B, 2 HR, 10 RBI (.748 OPS). Played in a career-high 139 games this season…Recorded career-highs in hits (132), RBI (69), and tied his career-high with 34 XBH (22-2B, 12-HR)...Finished the season 4th among qualified AL hitters in batting average with RISP, posting a .343 clip in 134 ABs with RISP...Finished 5th on the team with 34 multi-hit games, 4th on team with nine games of 3+ hits...Posted his highest WAR (Fangraphs, 2.0) since 2008 (2.2 with TB)...As a catcher, finished 3rd in the AL with a .267 batting average, 4th with 105 hits, and 5th with 56 RBI...At Rogers Centre, he hit .300 (75-250) with a .789 OPS… On the road, he hit .247 (57-231) with a .630 OPS...As DH, he hit .301 (22-73) this season...Tied his career-high with an eight-game hit streak from April 19-30...Batting just .154 (4-26) in May after posting a .314 average (27-86) in April...In 22 April Games, hit .314 (27-86)...Had his career-high tying eight game hit streak snapped May 1 at KC…Hit .452 (14-31) over the streak...Struck out for the 1st time this season April 10 vs. HOU, a span of 33AB...Stole a base in the 7th inning (11th career) April 9 vs. HOU…Was his first SB since Sept. 7, 2009 vs. NYY...His gap between steals was 4 years & 214 days, longest stretch between SB by a catcher since Koyie Hill went 6 years & 30 days (Aug. 16, 2004 - Sept. 15, 2010). Posted career-highs with a .300 average (min 20 AB) and 13 home runs. Played in 89 games, the highest total since appearing in 115 contests in 2009 with TB. Hit a combined .319 (67-210) from May 1 until the end of the season with a .877 OPS. Batted .279 vs. RHP and .361 against LHP, the highest mark since he hit .435 in 2005…Was productive with runners in scoring position posting a .319 average on the year with 3 home runs and 22 RBI. After signing a minor league deal with the Reds, January 16, Dioner split the campaign between Triple-A Louisville and Cincinnati, appearing in 24 games (16 starts) during two stints with the big league club...Posted a .290 batting average (20-for-69) with three doubles, a triple, two homers, 12 RBI and a .755 OPS in 24 games with Cincinnati ... batted .327 (16-for-49) vs. right-handed pitching....Made four appearances (two starts) with the Reds, August 4-8, while Devin Mesoraco was on the seven-day concussion disabled list ... was promoted again, August 21, when Mesoraco began a two-day suspension, and made 20 appearances (14 starts) the rest of the season....In his last 19 big league games of the season, hit .322 (19-for-59) with three doubles, a triple, a homer and nine RBI. ...In Cincinnati's 2-1 victory, September 27 vs. Milwaukee, became the first Reds player to produce a game-ending triple (off John Axford) since Reggie Sanders accomplished the feat September 7, 1993 vs. St. Louis. ...Made two appearances in the N.L. Division Series vs. San Francisco, including a start behind the plate in Game Four ... batted .250 (1-for-4) with a walk....Named an International League All-Star....Batted .319 (66-for-207) with Louisville ... has 12 doubles, five home runs, 32 RBI and an .832 OPS in 62 games, earning International League mid-season All-Star honors....Twice landed on Louisville's disabled list, April 29-May 7, with kidney stones, and July 16-25 with a strained left hamstring. Led all Major League catchers with 5 pickoffs (54g, 46gs at C)...began the season on the Dodgers' disabled list with a strained right oblique suffered during spring training...missed LAD's first 23g before he was reinstated on 4/25...on 8/23 was designated for assignment and on 8/30 was released. Split the season between the Majors and Triple-A Durham and made his fourth consecutive OpeningDay start for the Rays ... Was optioned to Durham on June 25 and remained there until rosters expanded on Sept 1 ... cwasbatting .210 with one home run and seven RBI when he was optioned to Durham ... Made 36 starts at catcher, his fewest since joining the Rays and the first time since 2006 he did notlead the team in games caught ... Threw out 35 percent (7-for-20) of runnersattempting to steal, the highest successrate among Rays catchers. ... Hit his lone home run of the season onJune 9 vs. Toronto off Shaun Marcum fromthe right side of the plate. ... Served a two-game suspension (April27-28) for his on-field actions April 23vs. Toronto when he was ejected byhome plate umpire Dan Bellino in the 6thinning ... cwas his first career ejection. ... Played in 43 games for the Bulls, 35 atcatcher, and hit .284 with a .387 OBP ... Reported to Spring Training healthy afterundergoing surgery on Oct 28, 2009 tostabilize the ulnar nerve in his left elbow. His .218 batting average was 219th out of 222major leaguers with 400 or more plate appearancesand his .261 on-base pct. was 221st...His batting average decreased 77 points from2009 (.295 to .218)...average was above .230only one day all season (April 13)...Batted .279 (39-140) from the right side...only3 major league catchers (min. 100 AB) hit fora higher average vs. lefties: MIN Joe Mauer(.345), NYY Jorge Posada (.290) and FLARonny Paulino (.290)...batted .182 (43-236)as a lefty...he hit .308 left-handed in 2008...anatural right-handed hitter, he is a .273 hitter(115-422, 15-HR) from the right side and .246(300-1,224, 18-HR) from the left side...Made 105 starts, all behind the plate, his fewestsince 2006...Threw out 19 of 80 base stealers (23.7 percent),a decrease from his career average enteringthe season (27.5) and his rate in 2008 (35.7)...Committed 3 errors June 6 at NYY, tying theclub record (5th time, last Josh Wilson onSep 1, 2007 at NYY)...it is a club record for acatcher...last ML catcher to commit 3 errorswas CLE Einar Diaz on June 1, 2001 at NYY...His 8 sacrifice bunts were tied with LAA JeffMathis for 2nd among major league catchersbehind DET Gerald Laird (10)...he had nearlyone-third of the Rays sac bunts (8 of 25)...hadone bunt single giving him 8 as a Ray...only 2other Rays catchers have recorded bunt singles:Toby Hall (2) and Mike DiFelice (1)...Homered Oct 3 off NYY Andy Pettitte, givinghim one more than in 2008...Batted .308 vs. the National League including.407 (11-27) in NL parks...Career average in extra innings is a .379(11-29) with 3 HR, 11 RBI and a .724 SLG,which ranks 14th among active players...as aRay has batted .385 (10-26), 2nd best in clubhistory (min. 25 AB) behind Carl Crawford's.393 mark...went 2-for-6 in 2009.Tied his career high with .. 4 hits, a homer and3 RBI off Ricky Nolasco in Rays 15-2 winMay 22 at FLA...On Oct 28, Dr. Koco Eaton performed surgeryto stabilize the ulnar nerve in his left elbow...he is expected to be fully recovered by springtraining. Twenty-four-year-old catcher enjoyed abreakout season in his second full year withthe Rays, earning AL All-Star honors.Hit .295, which ranked 2nd among AL catchers(min. 400 AB) trailing only MIN Joe Mauer(.330)...that also led all Rays hitters with atleast 400 AB...his average remained at .300 orbetter every day of the season until Aug 12.Caught 35.7 percent (25 of 70) of runners attemptingto steal, ranking 3rd in the majors(2nd in AL) behind NYY Jose Molina (43.2 percent)and MIL Jason Kendall (39.6 percent)...for comparison, the MLB average was 22.3percent...allowed the fewest stolen bases (45)of any AL catcher with at least 100 starts.Compiled a .994 fielding pct., 5th among ALcatchers...made first error of the season onJuly 1 vs. BOS, in his 428th chance...it was athrowing error on a bunt single by Jacoby Ellsbury...until then, he was the only qualifying ALcatcher without an error.Had two game-winning RBI against the RedSox, coming one week apart, to become thefirst player with two game-winning RBI in the9th inning or later against the Red Sox in a seasonsince TOR Tony Batista in 2000...on Sep9, he drove in the winning run (Fernando Perez)with a 9th-inning double off Jonathan Papelbonat Fenway...on Sep 16 vs. BOS, taggedJustin Masterson in the 9th for a walk-offbases-loaded single over the head of CF CocoCrisp, scoring Jason Bartlett...put the Raysback on top of the AL East with a 1.0-gamelead...was the Rays 11th and final walk-off victoryof the season, tying the team record.Spent 16 games on the 15-day DL, April 5-21,with right hand lacerations he suffered April 4at Yankee Stadium when he slipped in the dugoutbetween innings and sliced his ring andmiddle fingers...returned to the lineup April 22vs. TOR at Disney and collected 3 hits.On May 8 at TOR, belted his 2nd career grandslam in the 13th inning off Shawn Camp,powering the Rays to an 8-3 win...was theRays first-ever grand slam in extra innings...became the 13th player all-time to hit a grandslam in the 13th inning and the first AL playersince TOR George Bell in a 9-4 win over Seattleon July 9, 1985...had 2 bases-loaded plateappearances in May and cleared the basesboth times - also a go-ahead double in the 8thinning May 20 at OAK, providing all 3 runs inthe 3-2 win.Has hit .292 (177-606) since the 2007 All-Starbreak, trailing only Minnesota's Joe Maueramong AL catchers in that span...enteredthe '07 break hitting .177 with 1-HR, 13-RBI, a.238-OBP and .254-SLG.Had one of the best offensive seasons everby a Rays catcher...his 126-H, 27-2B, 34-BB,.295-AVG and .349-OBP as a catcher all setsingle-season club records for the Rays.Compiled a career-high 9-game hitting streakAug 30-Sep 13 (G2), batting .358 (14-39).Matched his career-high 4 hits twice - June 9at LAA (4-for-5, HR, 4-RBI, 2-2B, 3-R) and Sep4 vs. NYY (4-5, 2B, R)...in the June 9 game,also tied career highs with 3-R and 4-RBI...hishomer off Joe Saunders capped off the Raysfirst-ever back-to-back-to-back HR, followingEvan Longoria and Willy Aybar...Rays went onto beat the Angels, 13-4.On Aug 5 vs. CLE, was part of a second 3-HRinning for the Rays...Longoria homered, followedby back-to-back shots by Cliff Floydand Navarro.His 12th-inning RBI single Aug 14 at OAK offSantiago Casilla proved decisive in the 7-6win.Rays went 70-43 (.619) with him starting atcatcher...went 27-21 (.563) without him.Hit over .300 in 4 of 6 months: .400 in March/April, .333 in May, .314 in July and .317 in September...hit .194 (13-67) in August droppinghis avg. from .313 to .290.Hit .333 (5-15) with 1-HR, 7-RBI in extra inningsin 2008...career in extras is a .391 hitter (9-23)with 3-HR, 11-RBI, 2B, 4-R, .826-SLG.Had 2 bunt singles giving him 7 as a Ray...only2 other Rays catchers have recorded bunt singles:Toby Hall (2) and Mike DiFelice (1). ALL-STAR GAMEBecame the first Rays catcher ever to makethe All-Star Team in 2008...went 1-for-4 witha walk in the All-Star Game, including a 15thinningsingle that was part of the AL's gamewinningrally...caught 8 innings and threw outWAS Cristian Guzman trying to steal.Became the 9th switch-hitting catcher tomake an All-Star Team (Johnny Estrada, ToddHundley, Victor Martinez, Jorge Posada, TedSimmons, Mickey Tettleton, Jason Varitek,Butch Wynegar)...was the 9th All-Star fromCaracas, Venezuela (Chico Carrasquel, AndresGalarraga, Freddy Garcia, Ramon Hernandez,Magglio Ordoñez, Francisco Rodriguez,Ugueth Urbina, Omar Vizquel).Was the 4th-youngest Ray ever to make it(Kazmir, 22 in 2006; Longoria, 22 in 2008;Crawford, 23 in 2004)...with 3 All-Stars(Longoria, 22; Kazmir, 24) age 24 or younger,the Rays became just the 5th team since 1963to have 3 players 24 or younger on an All-StarTeam, first since the 1986 Mets. POSTSEASON EXPERIENCECaught every inning of all 16 games for theRays in 2008...hit a team-high .293 (min. 50AB) with 5-RBI, 4-2B and 4-R overall.At 24, became the youngest starting catcherfor an American League champion club sinceBAL Andy Etchebarren in 1966 (23).Hit safely in each of the last 7 games, fromGame 6 of the ALCS thru the end (9-23, .391).Batted .400 (6-15) in the ALDS vs. Chicago...inGame 2 at home, went 2-for-3 with 2 RBI (RBIsingle, RBI double). After the All-Star Break had the third-best average among regular starting American League catchers (.285) behind New York's Jorge Posada (.355) and Chicago's A.J. Pierzynski (.286) ... his .475 slugging mark after the break was also 3rd among major league catchers ... also had 8 homers and 31 RBI in the second half ... batted .177 with one homer and 13 RBI before the break ... Starting with May, increased his average each month through September: May (.143), June (.185), July (.203), August (.281), September (.306) ... Started a career-high 110 games ... Threw out 24 of 71 attempted base stealers ... his eraser rate of 25.3% was 12th best in the majors ... for comparison's sake, the major league average for catchers in 2007 was 22.0% ... threw out Ichiro trying to steal on back-to-back nights at Seattle, Sep 15-16 ... the 7-time All-Star was caught only six other times all season ... career as a Ray, has thrown out 42 out of 121 (34.7%) ... Batted .241 (26-109, HR-5) as a right-handed hitter and .221 (62-280, HR-4) as a left-handed hitter ... was nursing a sprained right wrist and batted righthanded exclusively, Sep 10-16 ... went 5-for-15 (.333) with a double, two sac bunts and two walks ... during his career has batted .279 (53-190, HR-7) from the right side and .237 (154-649, HR-11) from the left side ... Batted .306 (45-147) with seven home runs and 25 RBI in his last 47 games beginning July 27 ... in 72 games prior he batted .178 (43-241) with 2 home runs and 19 RBI ... had his best stretch between July 27 and Sep 11 when he batted .354 (35-99) and the Rays went 23-21 ... Led the Rays offense on a 13-game stretch in which they scored 118 runs, the sixth best two-week streak by a major league team in 50 years ... he batted a team-best .394 (13-33) during that stretch ... Had the first 4-hit game of his career on Sep 11 at Boston and had two of the hits off Ray-killer Tim Wakefield while batting righthanded ... also walked that game and over 9 plate appearances, Sep 11-14, he was for 4-for-4 with three walks and two sac bunts ... Had three bunt singles ... only two major league catchers had as many: Texas' Gerald Laird (10) and Minnesota's Joe Mauer (3) ... he has had have five in his two seasons with the Rays ... in their history, the Rays have had only three other bunt singles by catchers (Toby Hall-2, Mike DiFelice-1) ... Hit his first career grand slam on July 20 at Yankee Stadium off Edwar Ramirez in Rays' 14-4 win ... had been 0-for-9 with the bases loaded in 2007 prior to that home run, the most bases loaded ABs without a hit in the majors ... also had a "walk-off" home run against the Yankees on Sep 25 off Jeff Karstens in the bottom of the 10th inning. Acquired June 27 from the Dodgers along with RHP Jae Seo and a player to be named later (OF Justin Ruggiano) for C Toby Hall, LHP Mark Hendrickson and cash...Started 52 of the Rays' final 85 games after he was acquired...Began the season as the Dodgers primary catcher starting 23 of their first 29 games...Suffered a bruised right wrist on May 4 against the Padres when he was hit by a foul tip off the bat of former Ray Vinny Castilla...Was on the DL, May 5 to June 16, then optioned to AAA Las Vegas...Had batted .429 (12-28) in his last 10 games before the injury and was batting .280 overall in 25 games...Appeared in 78 games behind the plate with the Dodgers and Rays and started 75 games...Batted a combined .254 (68-268)...Doesn't turn 23 until Feb 9, 2007...In the last 25 years, only five catchers have caught 75 or more games in a season at a younger age: Joe Mauer (2005-MIN), Benito Santiago (1987-SD), Jason Kendall (1996-PIT), Ivan Rodriguez (1991-93-TEX) and Brian McCann (2006-ATL)...With the Dodgers, opposing base runners were successful on all 16 attempts against him...It was a different story with the Rays as he threw out a team best 18 of 50 (36.0%), 5th best in the AL (min 50 games)...For comparison's sake, the major league average for catchers was 24.3%...Tied a club record with three caught stealings vs. the Angels on July 16...Tied mark also held by John Flaherty and Toby Hall...Was batting .271 as a Devil Ray entering the final month of the season, but batted only .170 (9-53) in September...Closed out August with a torrid 13-game stretch (.381, 16-42)...Was the first catcher in major league history to start and finish a triple play when he and SS Ben Zobrist teamed up for the first-ever "2-6-2" triple play in major league history...It occurred in the first inning of the Rays-Mariners game on Sep 2 without the ball being put in play...Seattle's Raul Ibanez struck out with runners on first and third...Adrian Beltre tried to steal second and was out Navarro to Zobrist who tagged out Beltre as he tried retreating to first base...At that point, Jose Lopez tried to score from third and was thrown out, Zobrist to Navarro...Was the 2nd triple play turned in club history (also Sept 13, 2002)...Homered off Red Sox closer Jonathan Papelbon on an 0-2 pitch with 2 out in the 8th inning to tie the game at 6-6 on Aug 6 at Tropicana Field...Rays won it in the 10th, 7-6...Papelbon entered the game with a 0.49 ERA and had held opponents to a .142 average...Navarro's was just the 2nd run he had allowed on the road all season...Made his Tropicana Field debut on July 4 and went 3-for-4 with two runs scored and 2 RBI in the Rays' 9-6 win over Boston...Became the 11th switch-hitter in club history...Is a natural right-handed hitter who started switch-hitting at age 13...Missed the last 6 games of the season to be with his son in Tampa who was undergoing surgery to remove a kidney...Appeared in 40 games with the Tiburones in the Venezuelan Winter League...batted .231 catching 17-of-51 attempted basestealers (33%). Began the season at Triple-A Las Vegas before assuming the Dodgers' starting catcher's role after being recalled on July 29 ... Played in 50 of the Dodger's final 60 games, posting a .273 average, .354 on-base percentage and .375 sluggingpercentage ... At 21 years and 170 days old, he was the sixth-youngest player to appear in the National League in 2005 ... Hit .278 (15-for-49) in the seventh inning and later to go along with his .309 (30-for-97) home average, .435average as a right-handed hitter and .429 (3-for-7) clip with the bases loaded ... Made his National League debut July 29 vs. St. Louis and singled in his first Dodger at-bat against the Cardinals' Matt Morris ... Hit his first Major League home run on Aug. 12, a walk-off solo shot in the bottom of the 10th to propel theDodgers to an extra-inning victory vs. New York ... Missed the Sept. 13th game due tothe birth of his second son, Dioner Jr. ... Earned a spot on the Pacific Coast League team in the Triple-A All-Star Game for his play with the Las Vegas 51's ... Was named the eighth-best player inthe Minor Leagues at midseason by editors of Minor League News. Made his Major League debut with the Yankees, hitting .429 (3-for-7) with 2 runs scored and an RBI in five games ... Made his Major League debut on Sept. 7, 2004 at the age of 20 years and three months, becoming the third youngest player in the Major Leagues behind Tampa Bay's B.J. Upton and Kansas City's Andres Blanco ... Registered his first big league hit, a single, on Sept. 13at Kansas City off Chris George ... Split the season at Double-A Trenton and Triple-AColumbus prior to the late season call-up to New York ... Earned a promotion to Columbus after hitting .271 in 70 games with Trenton ... In 40 games with the Clippers, he hit .250 (34-for-136) ... In both leagues combined, he threw out 33 percent of the runners attempting to steal while committing just seven errors in 95 games behind the dish ... Baseball America rated him as the top prospect in the Yankee organization entering the season ... Batted .290 (20-for-69) at home for Columbus in the Triple-A International League. Began the season at Single-A Tampa, hitting .299 prior to a midseason promotion to Double-A Trenton ... Enjoyed tremendous success at the Double-A level, batting .341 with four home runs and 37 RBI in 58 games ... Made seven errors in 91 games behind the plate at the two levels combined ... Hit .329 with runners on base and .313 with runners in scoring position at Single-A Tampa ... Hit .387 with runners on base and .407 with runners in scoring position at Double-A Trenton. Spent the majority of the season at Single-A Greensboro, batting .238 with eight home runs and 36 RBI in 92 games ... Was a battery mate of current Dodger teammate Yhency Brazoban ... Appeared in one game for Single-A Tampa where he went 1-for-2 ... Committed eight errors in 87 games behind the plate for both clubs. In his first professional season, batted .280 with two homers and 22 RBI for the Gulf Coast League Yankees ... Made just three errors behind the plate in 40 games ... Named to the Gulf Coast League All-Star team. April 3, 2019 Columbus Clippers placed C Dioner Navarro on the 7-day injured list. February 7, 2019 Cleveland Indians signed free agent C Dioner Navarro to a minor league contract and invited him to spring training. 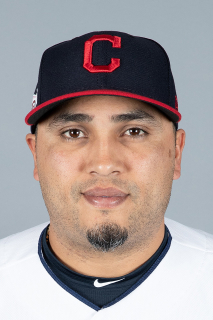 February 7, 2019 C Dioner Navarro assigned to Columbus Clippers. October 23, 2018 C Dioner Navarro assigned to Tiburones de La Guaira. November 3, 2016 C Dioner Navarro elected free agency. August 29, 2016 Toronto Blue Jays activated C Dioner Navarro. August 26, 2016 Chicago White Sox traded C Dioner Navarro to Toronto Blue Jays for LHP Colton Turner. December 4, 2015 Chicago White Sox signed free agent C Dioner Navarro. November 2, 2015 C Dioner Navarro elected free agency. June 2, 2015 Toronto Blue Jays activated C Dioner Navarro from the 15-day disabled list. May 26, 2015 Toronto Blue Jays sent C Dioner Navarro on a rehab assignment to Buffalo Bisons. April 23, 2015 Toronto Blue Jays placed DH Dioner Navarro on the 15-day disabled list retroactive to April 22, 2015. Strained left hamstring. May 17, 2014 Toronto Blue Jays activated C Dioner Navarro from the bereavement list. May 14, 2014 Toronto Blue Jays placed C Dioner Navarro on the bereavement list. December 2, 2013 Toronto Blue Jays signed free agent C Dioner Navarro. November 16, 2012 Chicago Cubs signed free agent C Dioner Navarro. November 3, 2012 C Dioner Navarro elected free agency. August 21, 2012 Cincinnati Reds recalled Dioner Navarro from Louisville Bats. August 9, 2012 Cincinnati Reds optioned Dioner Navarro to Louisville Bats. August 1, 2012 Cincinnati Reds selected the contract of Dioner Navarro from Louisville Bats. July 25, 2012 Dioner Navarro roster status changed by Louisville Bats. May 7, 2012 Louisville Bats activated C Dioner Navarro from the 7-day disabled list. April 5, 2012 C Dioner Navarro assigned to Louisville Bats. January 17, 2012 Cincinnati Reds signed free agent C Dioner Navarro to a minor league contract and invited him to spring training. August 30, 2011 Los Angeles Dodgers released C Dioner Navarro. August 23, 2011 Los Angeles Dodgers designated C Dioner Navarro for assignment. April 25, 2011 Los Angeles Dodgers activated C Dioner Navarro from the 15-day disabled list. April 18, 2011 sent C Dioner Navarro on a rehab assignment to Chattanooga Lookouts. March 30, 2011 Los Angeles Dodgers placed C Dioner Navarro on the 15-day disabled list retroactive to March 22, 2011. Right oblique strain. December 14, 2010 Los Angeles Dodgers signed free agent C Dioner Navarro. December 2, 2010 C Dioner Navarro elected free agency. October 13, 2010 Dioner Navarro roster status changed by Tampa Bay Rays. September 1, 2010 Tampa Bay Rays recalled Dioner Navarro from Durham Bulls. June 25, 2010 Tampa Bay Rays optioned Dioner Navarro to Durham Bulls. October 8, 2009 C Dioner Navarro assigned to Tiburones de La Guaira.